Support is provided through DianHua’s User Voice site. Feel free to provide suggestions and submit problem reports. Can I draw to search for Traditional or Simplified characters? You can use the Chinese keyboards in iOS to enter characters by drawing, typing Pinyin, or using a number of other entry alternatives. The following video will show you how to navigate to the Keyboards inside the iOS Settings application. When I export from DianHuaDictionary.com and import into Excel, the Chinese characters are mangled. How do I import properly? Though I have not tested this procedure myself, I found several references to it on the Internet. Apparently, Excel does not support UTF-8 character encoding for CSV files. However, it DOES support UTF-8 encoding for TXT files. So, you should be able to rename files from .CSV to .TXT file extensions and open in Excel. Excel should prompt you for the character encoding during import at which time you should select UTF-8. Another option employed by some users is to import into OpenOffice, NeoOffice, or Google Docs and save the result as an Excel document. How do I create Bookmarks so I can study using Flashcards? Touch the Search tab to search the dictionary. Search for a word you want to study. For the purposes of this example, search for “hello”. You should now see a list of entries in the dictionary matching your search criteria. Touch the “你好” entry. You should now be on the definition page. At the top, right of the page, there is a plus (+) sign, or Add Bookmark, button as in the screen-shot below. To create a bookmark, touch the Add Bookmark button. You should now see the Add Bookmark screen. It allows you to file your Bookmark into any number of folders, much like a web browser allows you to organize and categorize web site links. You can either type in the name of a New Folder in the box at the top, or you can select from the list of existing folders. If this is your first Bookmark, the list of Existing Folders will be empty. 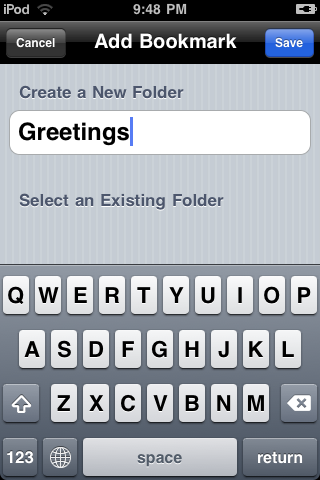 While you could file everything in the “root” folder, it would be best to use folders so type “Greetings” into the “Create a New Folder” field. That’s all it takes to create a Bookmark. Note that the next time you create a Bookmark, your Folder selection will default to the one you most recently created/selected. You can touch the “Bookmarks” tab at the bottom of the screen to view your newly created Folder and Bookmark. The next step is studying Flashcards using the Bookmarks you have created. In the study tab, you are first provided a list of all of the study tools. As of this writing, the only two available tools are Flashcards and Typing/Writing. The setup on either tool is basically the same so these instructions will focus on Flashcards. You should now see the Flashcard Settings. The first Setting is called Order. This setting determines the order in which your Flashcards will be displayed. Use Random Order the first time you study a set of Bookmarks to make sure you see each card at least once. This will help initialize the Difficulty Order algorithm. Use the Difficulty Order if you want to see Flashcards you find more challenging, more frequently. The second Setting is called Front. This is a list of dictionary fields you can select for the Front of the Flashcard. Select all fields you would like. The third Setting is called Back. Like Front, it is the list of fields you would like to see on the back. Hint: In my studying, I’ve found that I learn Chinese characters better if I put them on both the Front and the Back. The final setting is called Bookmarks. This is a list of folders you have created. Indentation shows the full hierarchy as you have created it. Any folder you select will select that folder and all of its descendants. To study the Bookmark created in step 1, use the default settings and make sure a check mark is shown next to the “Greetings” folder. Touch “Begin” in the upper right to be taken to the Flashcards. When you start DianHua Dictionary the first time, it will ask whether you want to create an account on DianHuaDictionary.com. If you did not create one at that time, touch the Settings button at the top left of the Search window to bring up the Settings. Touch “Sync Now” to initiate a sync which will then prompt you for account information. Once you have an account, you can either Sync manually using the Sync Now option under Settings, or you can Sync automatically by turning on Continuous Sync under Settings. On an iPhone or iPod touch 3rd generation, the device is set to Silent mode with the switch on the side. On an iPod touch (1st and 2nd generation only), you need to plug in a headset or speaker of some sort since it does not have an external speaker like the iPhone. How do I import Bookmarks into Anki? To create an Anki compatible file, open the DianHuaDictionary.com export file in a Spreadsheet application and copy/paste/delete columns as appropriate to create the Front/Back as needed. For the Tags column, you could use the Folder field to help categorize the Bookmarks inside Anki. Make sure you save in UTF-8, then import the new file into Anki. Go to Tools, Deck Properties. In the Models and Priorities tab, click Add. Select “Copy: Basic” and click Ok. Select “Basic copy [0 facts]” in the Models list and click Edit. Change the name to DianHua Dictionary. 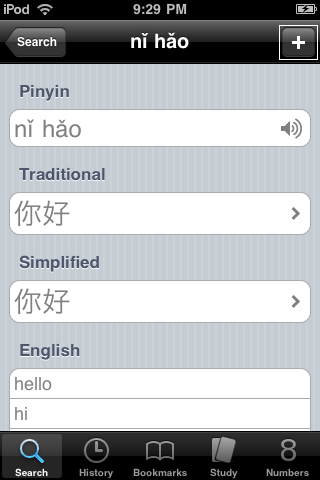 In the Fields list, add: Simplified, Traditional, Pinyin, English, Folder (IN THAT ORDER). In the Fields list, remove Front and Back. While here, make a Card Template. Click the Card Templates tab. Close out of the two Dialogs and go to File, Import. Select a CSV file that you have exported from DianHua Dictionary. Click the “Auto-detected delimiter” and change from “/” to “,” comma (don’t type the quotes). Make sure the Model field is set to DianHua Dictionary. You should now be able to study the information from the export file with Simplified on the front and Simplified, Pinyin, and English on the back. Use the Card Template properties to change the front and back as appropriate.